Learn how to ride a Motorbike in the Desert or join one if our thrilling Open Desert Adventure tours on our KTM Enduro 500cc (2017 Model) Motorcycles. Adventure and Fun guaranteed. 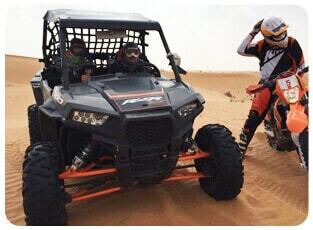 Experience 4 wheel Quad Bike riding in the Red Sand of UAE Desert. Alone or in a group of riders. No Riding experience required. 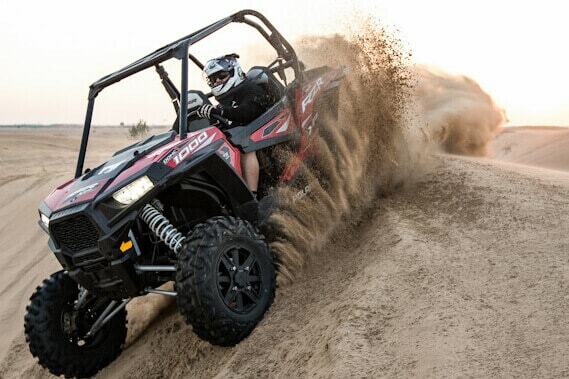 Polaris RZR Buggy Tour– The ultimate Dune Bashing Machine. Take a Seat – Start the Engine – Enjoy your Trip! Discover the thrill of powerful Yamaha Raptor 700cc Quad Bike ride on the sand dunes of Dubai and travel the dunes with an experienced tour guide. Enjoy an exhilarating drive through the magnificent and ever-changing sand dunes of Dubai on the Quad Bike (ATV) Safari Tour. Experience the thrill of driving through Dubai’s shifting sand dunes on an adventure safari perfect for the outdoor enthusiast and nature lover. Polaris RZR 4×4 Buggy Safaris offers a new dimension to off-road exploring. Get on an 800cc / 1000cc Buggy and set off on an adventure like no other on this fully-guided tour Desert Adventure Tour. Your instructor will guide you through a natural dune trail, riding at a comfortable pace for you. Take a break for refreshments, and set off again into the sand! Your guide will be shown the best routes to take and will make sure you ride at a pace that you find comfortable. If you’re feeling a bit tired, stop for a break and some refreshments before heading off in-to the sandy dunes once again. For your comfort and safety each dune buggy comes equipped with a full roll cage, bucket seats, and a full safety harness. You can also choose to book this tour in a group of 2, sharing the buggy between the two of you. Capture some amazing photographs at the Dubai Deserts on one of your important and best days in your life. Are you tired of driving in a car? Do you fancy riding at full pace? 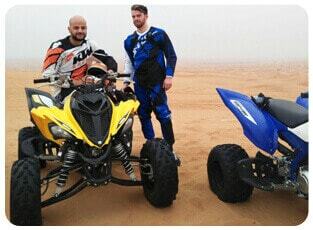 Rent a Motorcycle or Quad bike in Dubai. Motorcycles can make your adventure a reality. There is nothing like climbing a motorcycle and hitting the road. Motorcycles are unique means of transport that can make adrenaline rush through the veins; it creates an unrivaled impression that is not found anywhere and also pumps up the body. Motorcycles offer a thrilling ride beyond your thirst for something new and adventurous; with a motorcycle, you can overcome different mountains and highways while rushing towards adventures. If you are tired of your daily routine and desire to feel a burst of energy, Dubai motorcycle rental is right for you. If you want to experience the fun of motorcycle or Quad bike in Dubai, DuneBikeDubai offers you different types motorcycle and Quad bikes for rental in Dubai. Choose from the latest KTM Enduro 450 and KTM Enduro 500 (2017) models and from Yamaha Raptor 700cc, Cobra 400cc / 220cc, Access 300cc, Suzuki 90cc . You will experience the best quality services at an affordable price. Every rider starts from the beginning. If you have no experience in motorcycling or you haven’t done any professional training and want to experience overwhelming feelings of riding a motorcycle in Dubai. Companies offering motorcycle rental Dubai will provide an instructor to teach you the skills and techniques involve in biking. You will be taught basic skills for staying safe on the road such as acceleration, braking, turning, shifting, and controlling skids to make your biking experience a memorable one. Also, if you have been riding for years and wanted to have a taste of motorcycle rental in Dubai, there are classes you can attend to enhance your riding skills and techniques. You’ll be taught how to handle your bike at low speeds, how to maneuvers, quick stops and safe swerves. 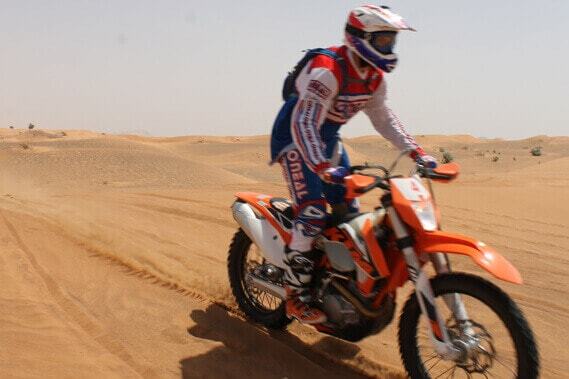 Motorcycle rental in Dubai is an incredible fun activity. No traffic rules, no speed limits and the soft sand of the Dubai desert shows some mercy if you should fall, no pavement to hit. But, riding a motorcycle in the desert is also completely different than riding on the street. Whether you are a professional street bike rider or a beginner on 2 wheels, there are certain tips that you should consider for riding off-road with your Dubai motorcycle rental. This will help to make you ride faster and safer. For Two-Finger Operation for Your Clutch Lever One important things in the desert is throttle control and clutch operation. Part of that is using only your middle and index fingers. This allows you to operate the clutch without losing the grip on the handlebars. Your responses will be much faster and smoother while your arm is angled more steeply. That is important at low speeds and while challenging technical dunes. Soft Sand is very common in Dubai and can be very challenging. What do we need here? Just Gas It! Speed Up and Lean Back! While on the road you learned to slow down which is the best approach on a heavy bike surrounded by bigger cars and trucks. A motorcycle rental in Dubai is different. The Dubai motorcycles for rent are lightweights compared to street bikes. With around 100kg the rules change off-road? Just Gas It is the key, the momentum that you gain with the speed will always carry you over or through tough terrain like deep soft sand. Moving your weight backwards adds traction to the rear wheel, where the power is needed and it´s taking weight off the front wheel to avoid it digging into the sand and letting you fly over the handlebar. Stay away from the front brake! Riding in soft sand where there’s only little traction. The front wheel might dig into the sand and let you crash. Don’t try to trail brake, this will simply wash out the front. Look where you want to go! This applies to street riding too. Consciously check your surroundings and turn your head and focus on where you want the bike to be. Your body will follow your head and the bike will follow that. Most crashes in the desert happen because riders don´t pay attention to what happens around them. Safety is essential when riding a motorcycle. Motorcycle rental Dubai companies prioritize your safety and provide you with the best facilities and gadgets. They will give you a helmet along with the rental motorcycle. You also get an optional insurance coverage on any rental motorcycle making your on-road and off-road biking a satisfactory experience. If you need a motorcycle for a long ride, an event or a motorcycle rally, stop letting your desires vanishes, rent a motorcycle in Dubai and make your plans a perfect memory. We recommend motorcycle rental in Dubai for experts and unprofessional who want to explore a new adventure. Fantastic Tour, Great Team Really enjoyed a custom made 4 hours KTM tour with two guides. Driving into the night with these local experts was a joy. Great team – I will be back for more. Amazing ATV and KTM Tour !!!! !My brother and I booked a tour with RedDunes. It was really convenient since I wanted to hire an ATV while my brother wanted the KTM Motocross, and we could still go together on the same tour. We had the best time ever!! Great adventure 5 of us went out in two dune buggies and a quad bike. What great fun! Aschraff our guide was very helpful especially when we got stuck in the dunes (more than once!) The vehicles were in great shape, it was excellent value for money in comparison with other companies and Indika (the boss) was proud, informative and helpful. I would definitely recommend this to anyone visiting Dubai.